Morse code (CW) is probably my favourite mode of operating. There is something of a skill involved and therefore much more gratification to be had from operating this way. Also the conversations, whilst taking longer to produce, (unless you are looking at some of the below the noise digiatal modes - they can be extremely slow and with hardly any converstion at all) CW does give the operator time to think through what they are saying and you can have some very long and interesting conversations that way. There are also some stations that don't want the rag chew kind of contact and just go for the 599 report, so if that is your cup of tea then that is available too. These can be very good though for working DX and obviously DXpeditions work this way as well. 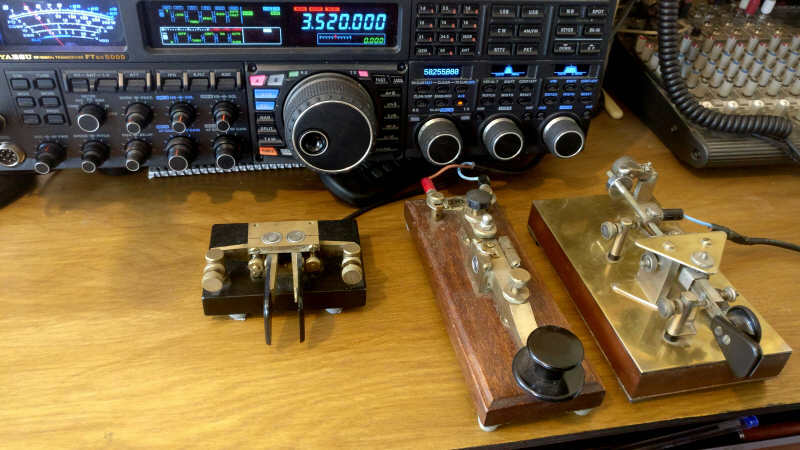 As I am sure you will be aware, CW is a very efficient method of communication in the respect that you can get through and make contacts when SSB can't. I also run the CW practice nights for the Verulam Amateur Radio Club. These take place on the 10m band at 28.040MHz. This is open to everyone to take part in, and we especially encourage learners to take part. We are alway very happy to slow down (QRS) to a slower speed to accomodate anyone learning. So please do join us, no matter how good or bad your standard is!! We look forward to hearing you any time from 8.30pm on a Sunday evening. I originally learnt the code over the period of time that I was studying for the RAE (Radio Amateurs Exam as was back in 1990). At that period of time I was working of a farm, and there was no internet or easy way (that I knew of) to learn morse. So I recorded a cassette tape that I made from recordings I took of my shortwave reciever (an old war time HRO) and played it back over and over again while working in my tractor. Gradually I was able to take and understand more and more of the code. It took about 9 months for me to get to a point where I was up to speed ready for the test. At that time there were only two licences, a class A and a class B. The only difference was the fact that for the class A you had to pass a morse test of 12 words per minute. This then gave you access to the HF bands which at that time were not permitted to class B operators. So I decided I was not going to go for a B licence as I was pretty sure I knew myself well enough that once I had the B licence I would never get around to taking the A. And the HF bands were where I wanted to be! So I took the morse test in September of 1990 and passed it, gaining the A licence that I recieved in the November. At that time the licences were dished out strictly in alphabetical order, so if you wanted a specific call you could put your name to it, but you had to wait for to come around before you could take it up and use it. I decided I didn't care too much for which call I got, but I went through a number of the calls that were about to be issued and asked not to be issued with any of them. If I had thought about it G0OIK would have been one I would have added to that list, but needless to say, that is the one I got! As a result I've never wanted one of those personalised number plates, mine would read GO OIK! When learning there are various ways of going about it. You can do what I did, which in hind sight may not have been the most efficient way of doing it. You could learn how each letter is represented with dots and dashes, and then listening to the code try and pick out how many dots and dashes you hear and then work out what the letter is! These days it is recommended to use either the 'Farnworth Method' or the 'Koch method' when learning. The Farnsworth method consists of listening to code at the speed you wish to reach - perhaps 18 wpm - with large gaps between the letters. This gives you time to recall what each character is before you move onto the next one. Then as you get to decoding about 90% correctly you would reduce the gap between the letters until eventually you are copying at a the wanted speed. . Once you can distiguish between the first two letter you would introduce one or two more and repeating the process until you could pick out the whole alphabet at the speed you wanted to achieve. In this way you are not listening for the numbers of dots and dashes, but are recognising each letter just by the overall sound of it. The Kock method consists of again listening to the code at the speed you want to achieve, but starting by distiguishing between just two characters of the alphabet. Then you would add one or two more charactors at a time untill you have the whole alphabet involved. To me this sounds like the best way of doing it, but I would imagine you would need to keep the training going over a period of time otherwise you would have to start again! Having said that, constant practice with any method is an essential! 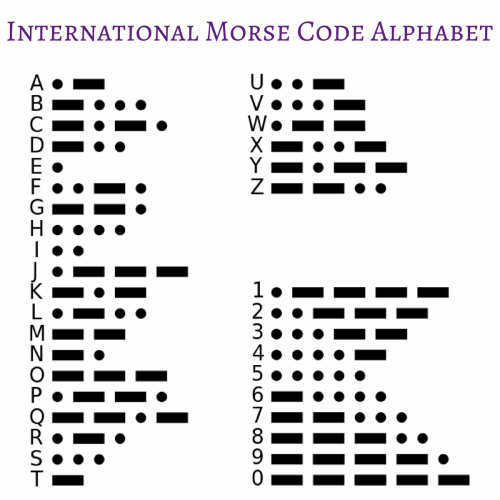 These days there are any number of helpfull programs, apps and websites that are very good and useful to help learn the morse code. Here are just a few that spring to my mind..